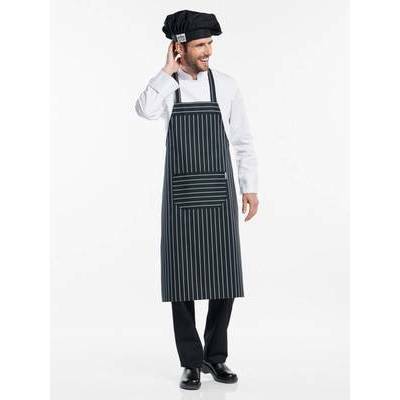 Our standard Chaud Devant Bib Apron Big Stripe is characterised by a practical and ergonomic design. The model is sleek and minimalist and one size fits all thanks to the adjustable fastening at the neck. 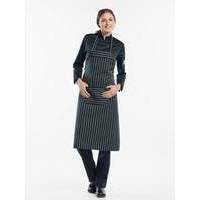 The fabric is positioned perpendicular at the top of the bib and on the pocket, creating a stunning stripy contrast. 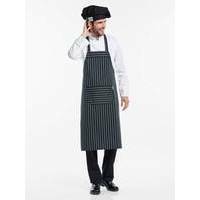 The Chaud Devant Bib Apron Big Stripe�s fabric, the well-known �Butcher Stripe� is a little more subtle than that of the Remo and gives it a sophisticated look.